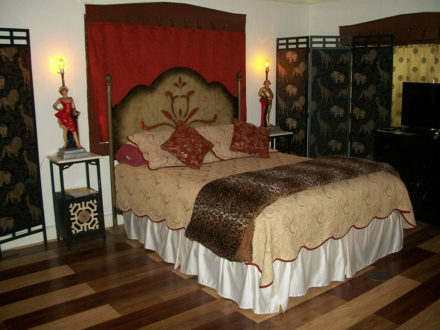 NOTE – The rate is based on 2 guests. 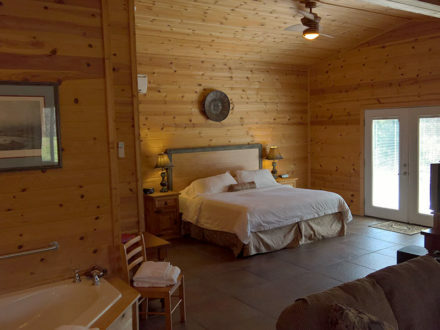 Additional guests are $10.00 per person per night. 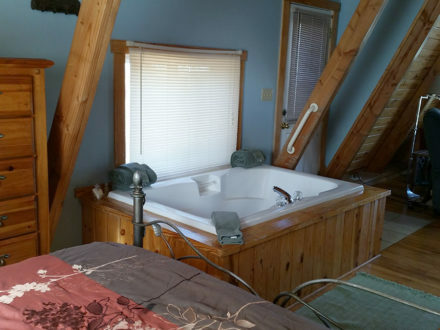 Maximum of 2 Adults and 2 Children. 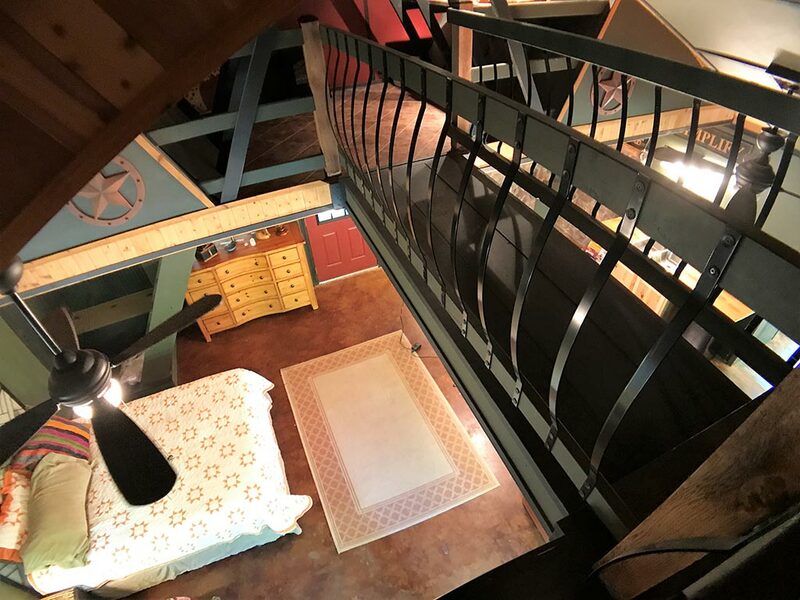 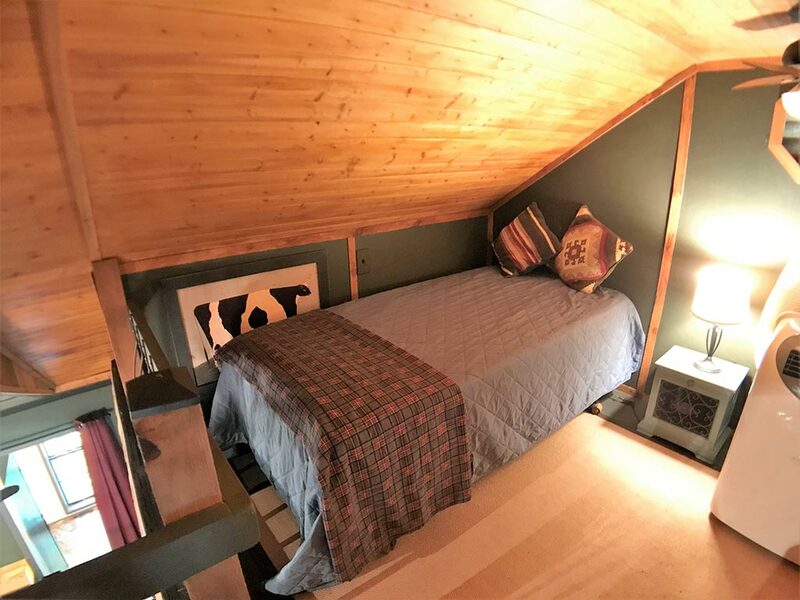 Loft – Two Twin Beds. 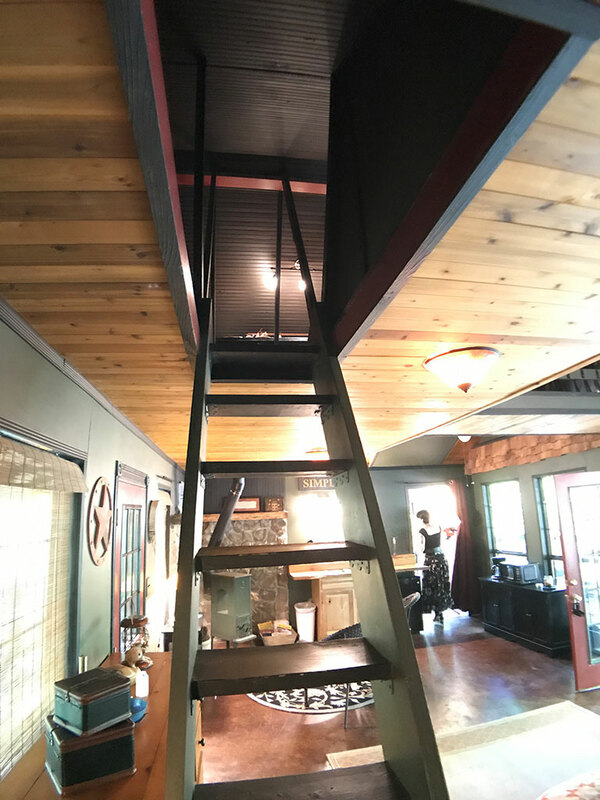 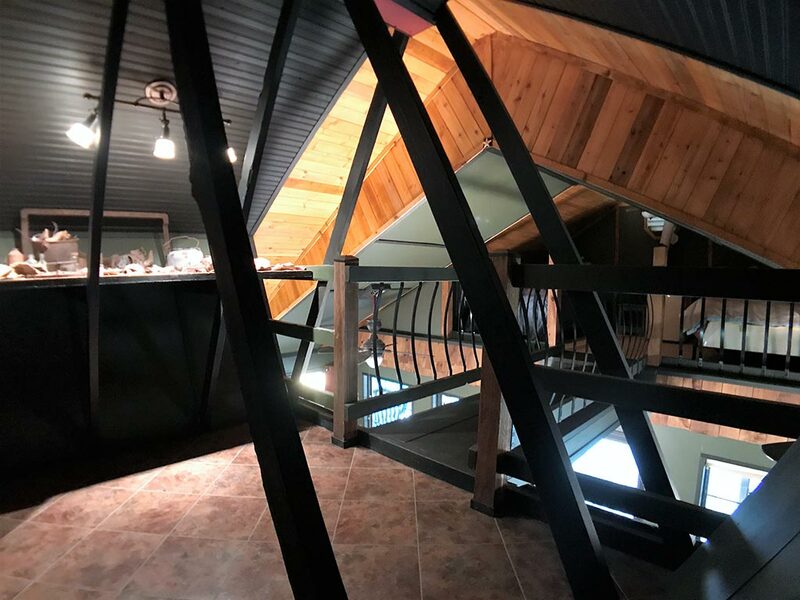 IMPORTANT: The loft ceiling is low and the stairs are similar to a ladder, requiring full mobility to navigate in and out of the loft. 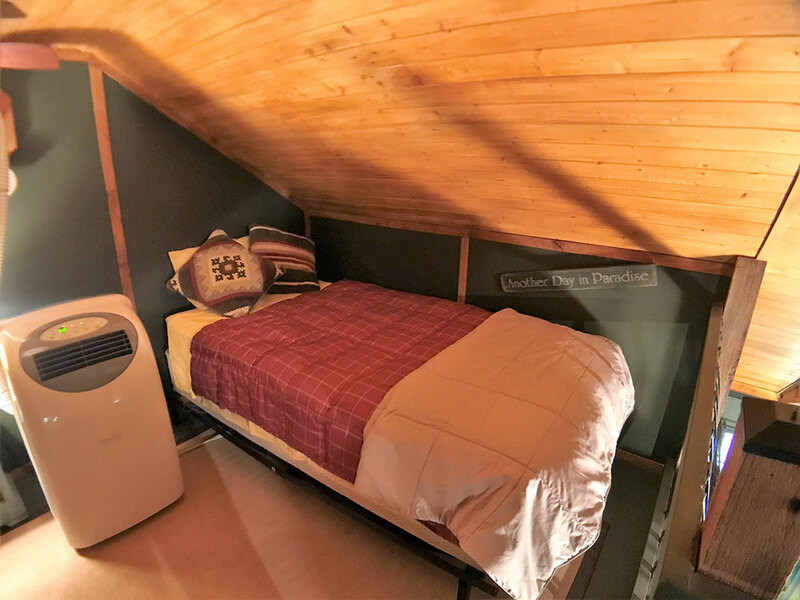 It is suitable for children, but not the most comfortable area for full size adults. 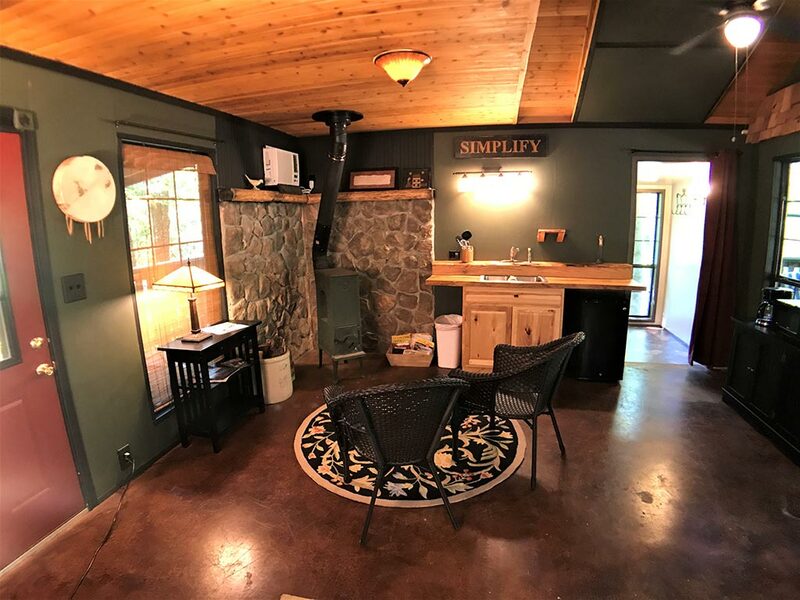 Kitchenette – Coffee Maker, Microwave, Small & Full size Refrigerator, Stainless Steel Double Sink. 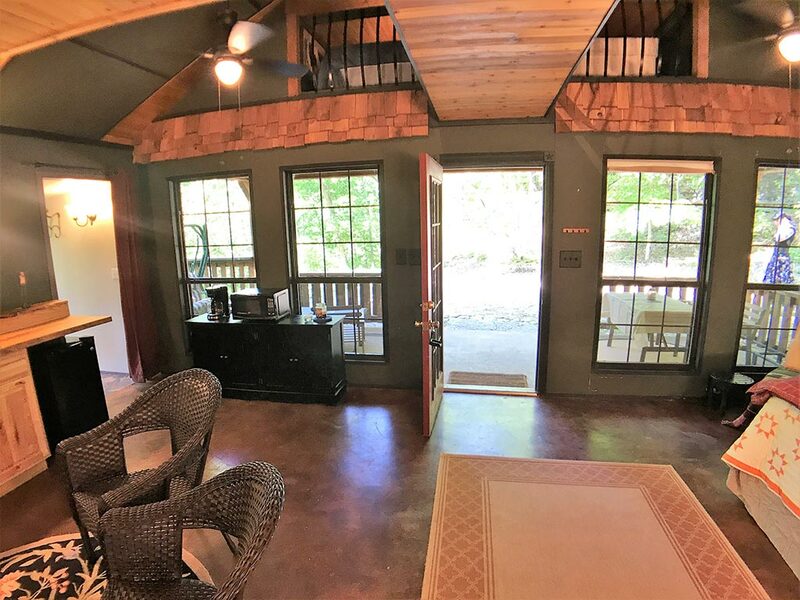 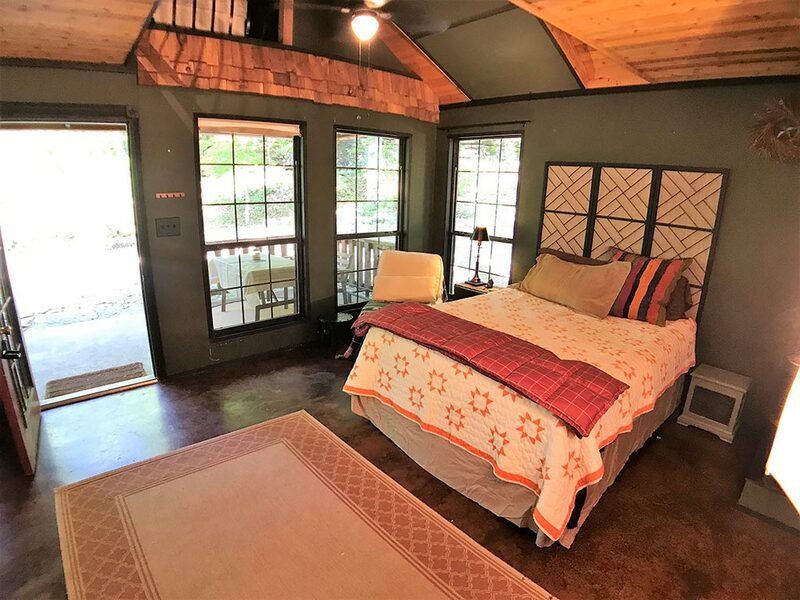 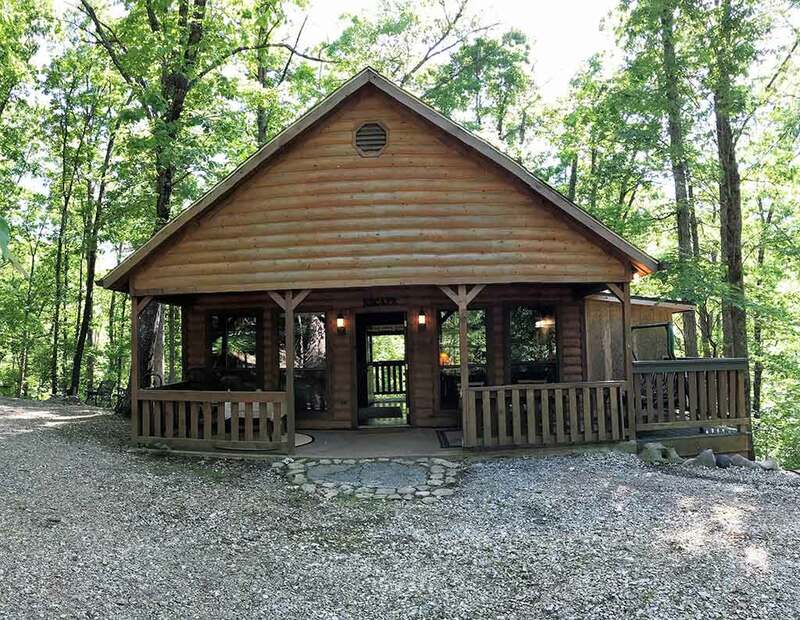 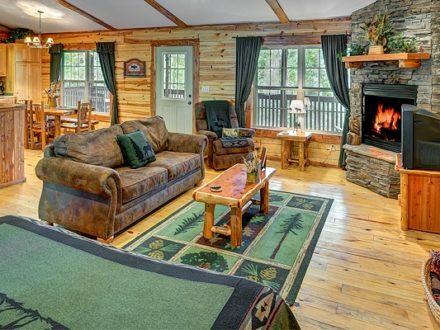 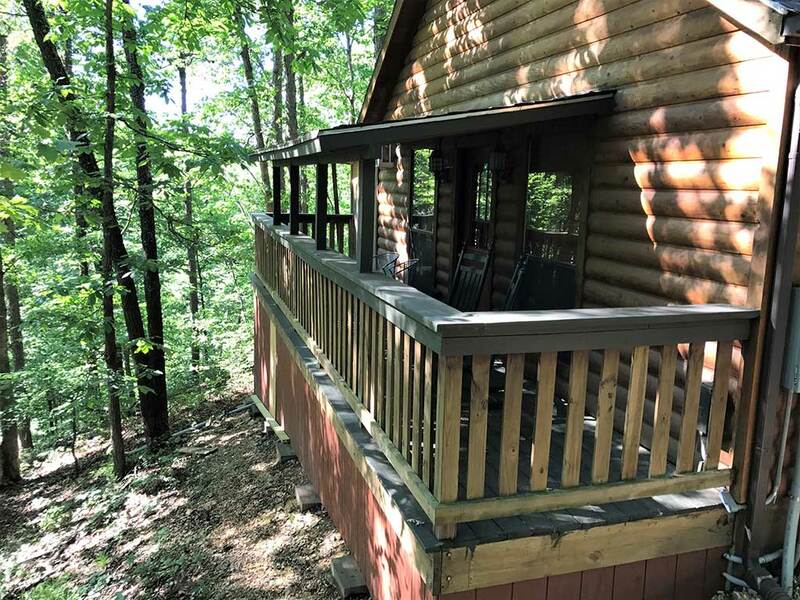 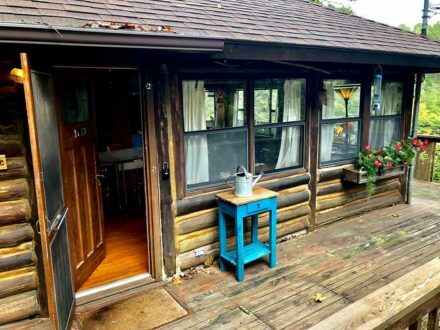 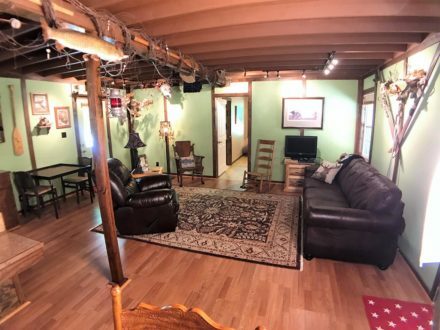 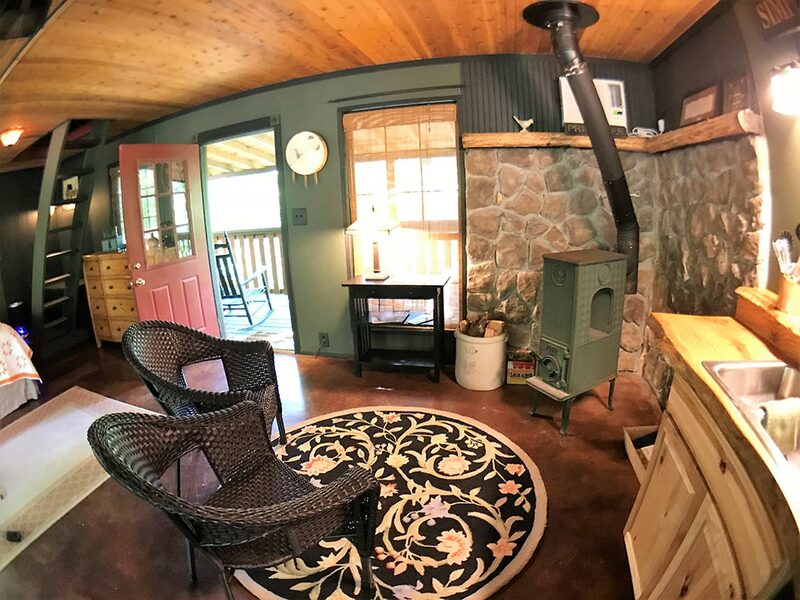 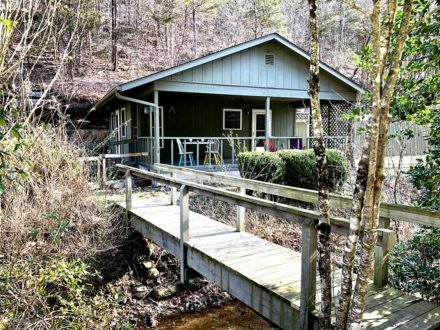 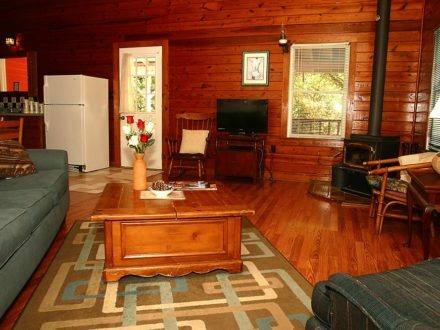 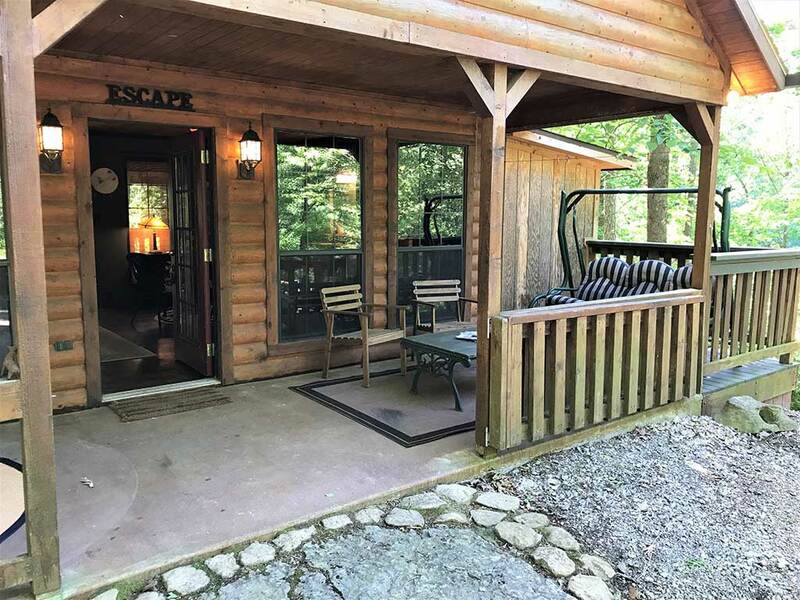 This secluded cabin has been completely remodeled into a unique and private retreat for two to four. 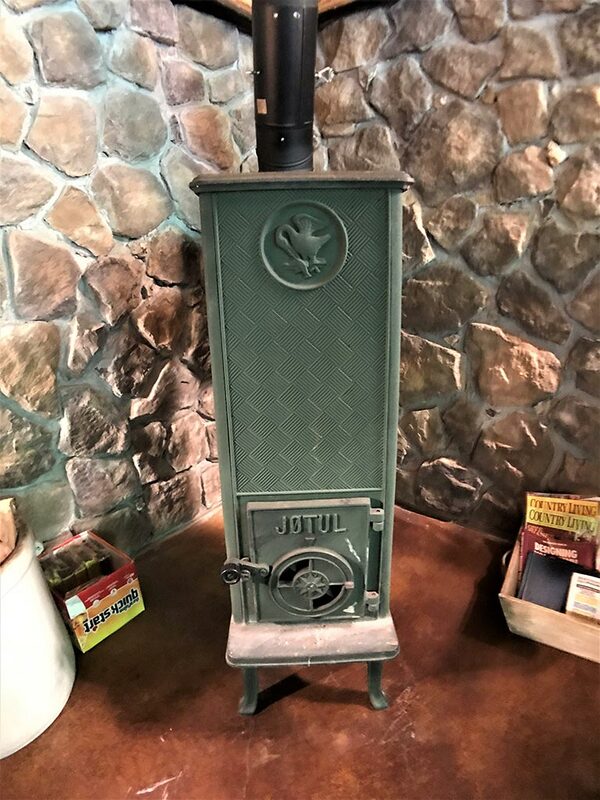 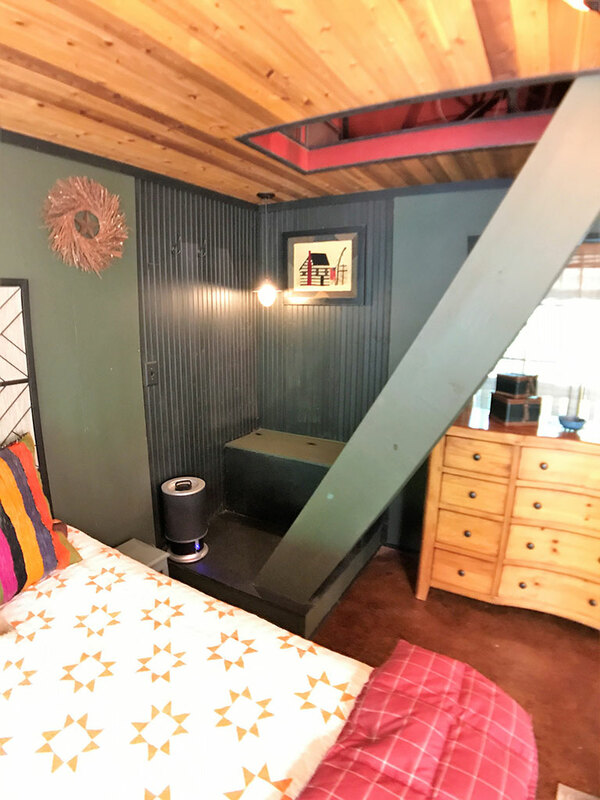 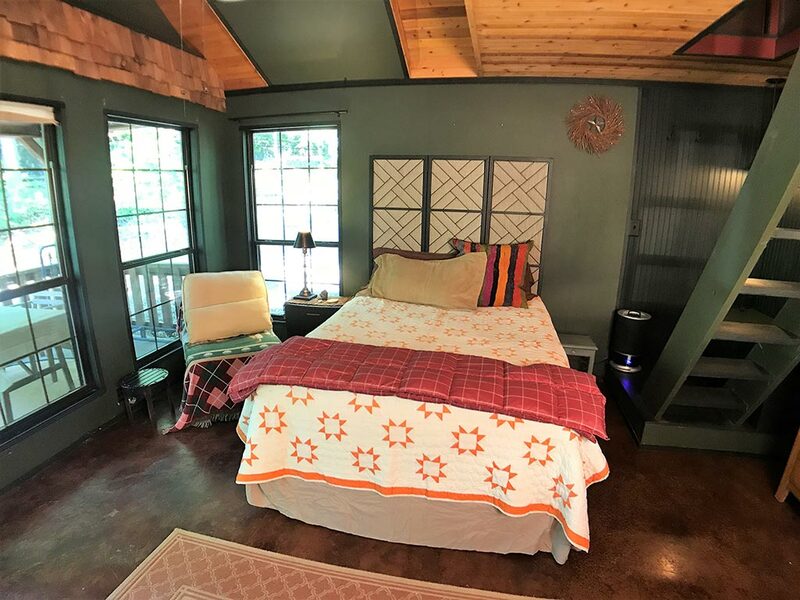 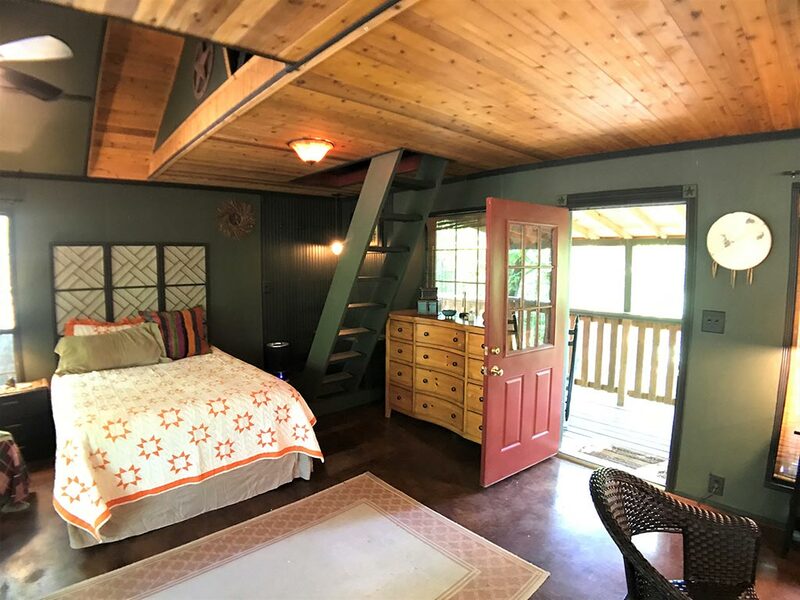 This one room cabin with a loft features a queen size bed, kitchenette, seating area with a small unique wood stove for those cool nights. 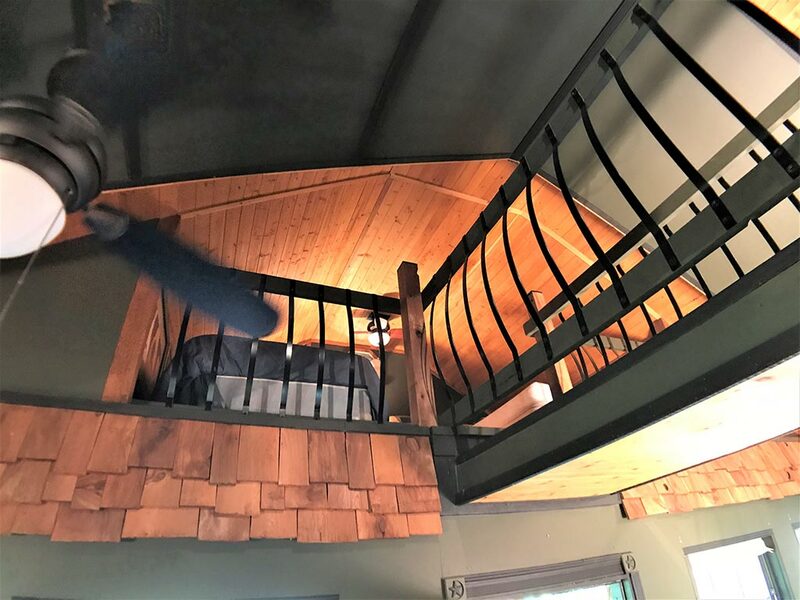 There is a somewhat steep LADDER stairway to two lofts with a walkway between them over the room below. 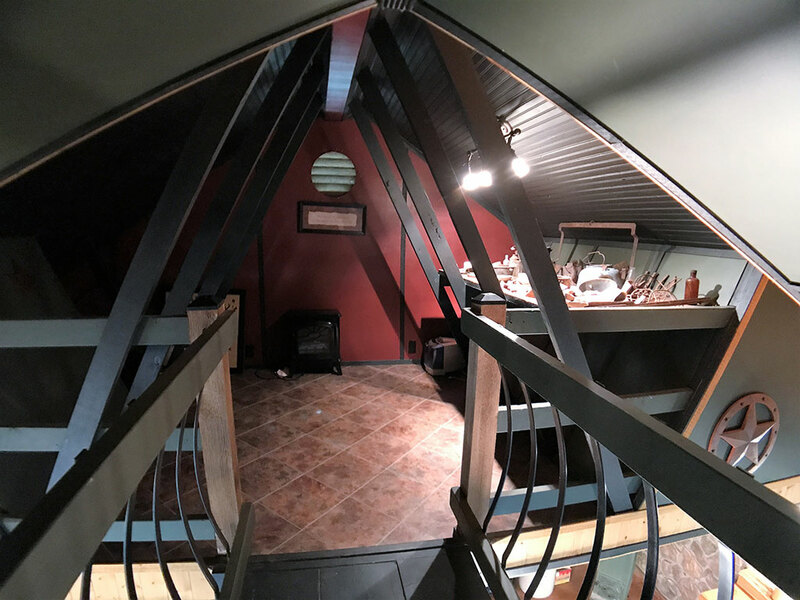 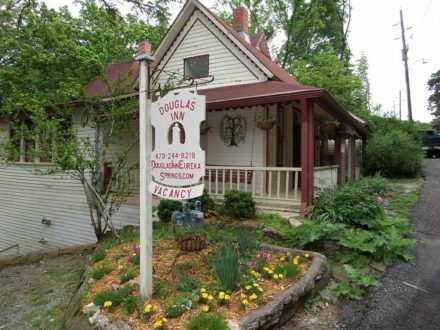 On one side there is a sleeping loft with two twin beds and the other side has a table with artifacts found on the property around the cabin and the spring. 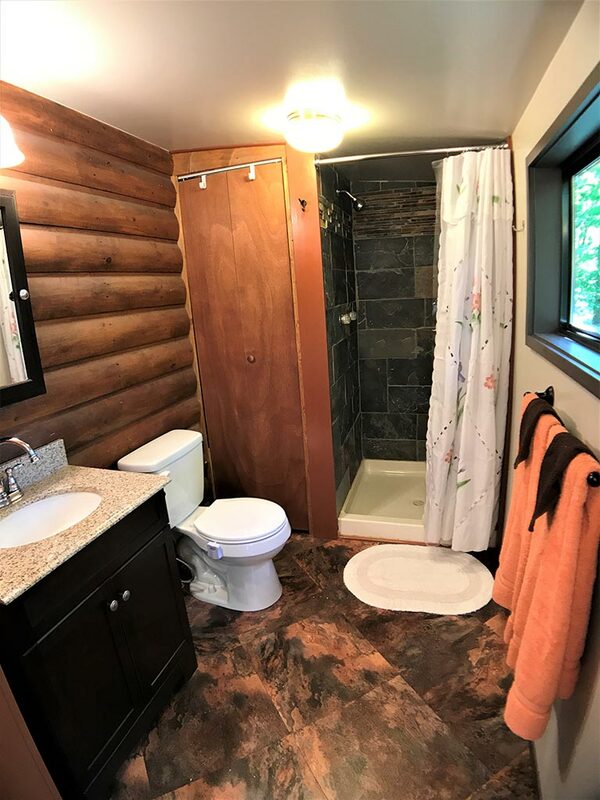 A full bathroom was added to the cabin during the remodel. 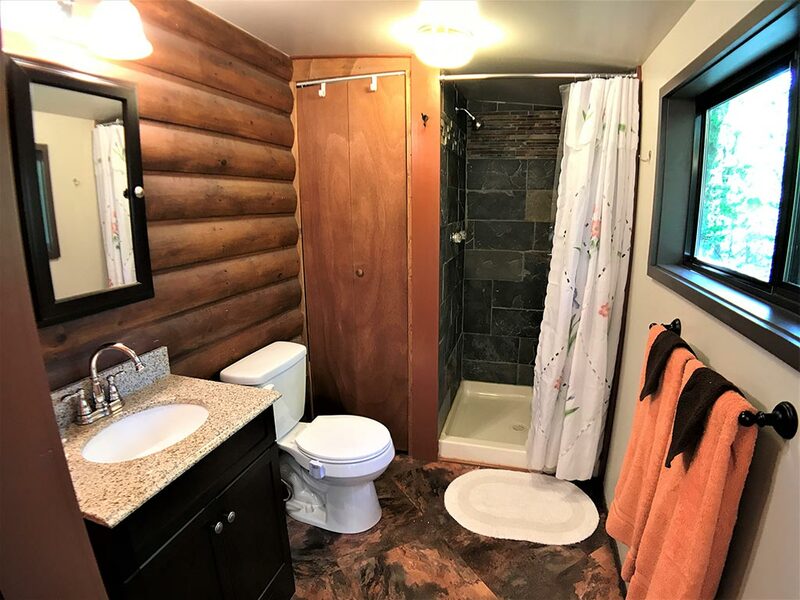 It features a stone tiled walk in shower. 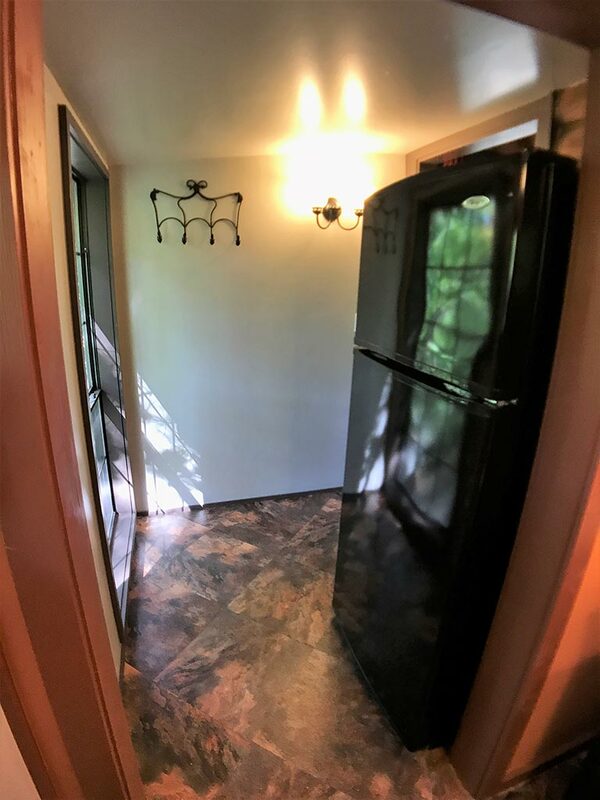 Also in this addition is a full size refrigerator for additional food or beverage storage. 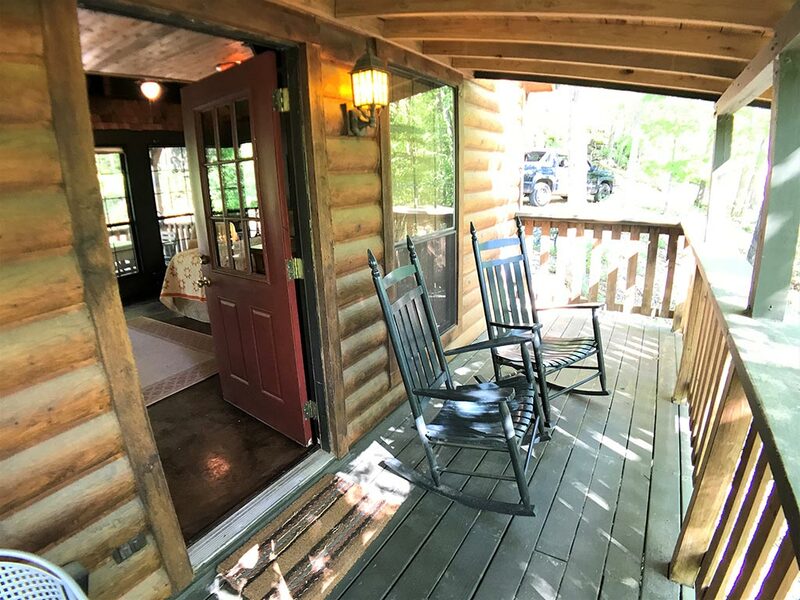 There is seating on both the back and front decks, with a comfy swing on the front porch as well as a table and chairs. 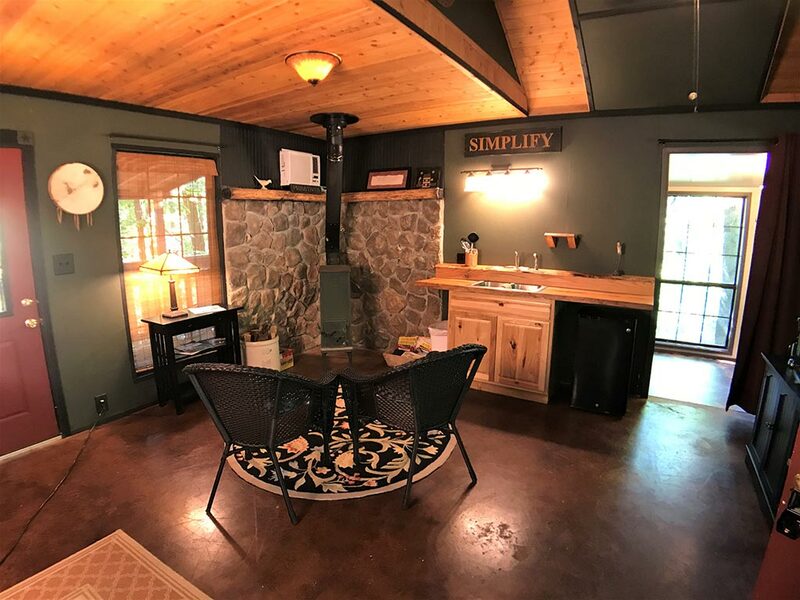 There is a fire pit, wood not provided (other than what you gather from the woods). 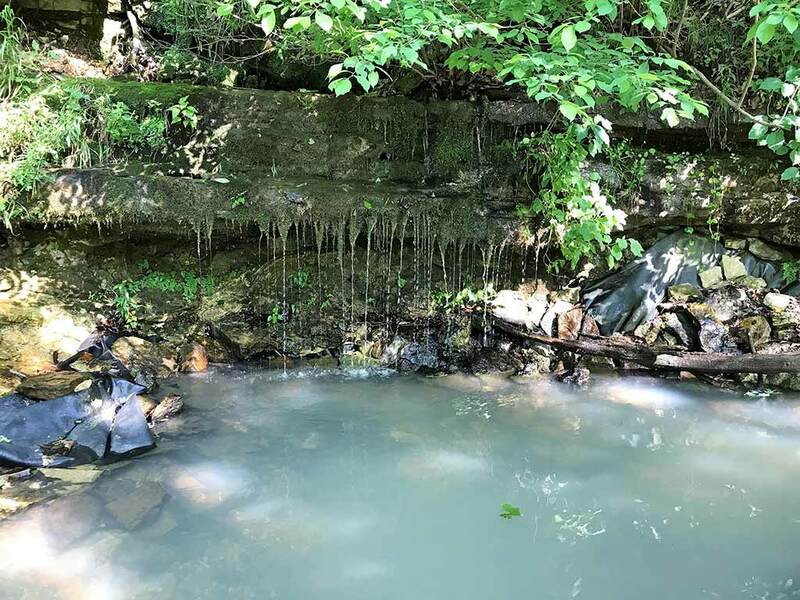 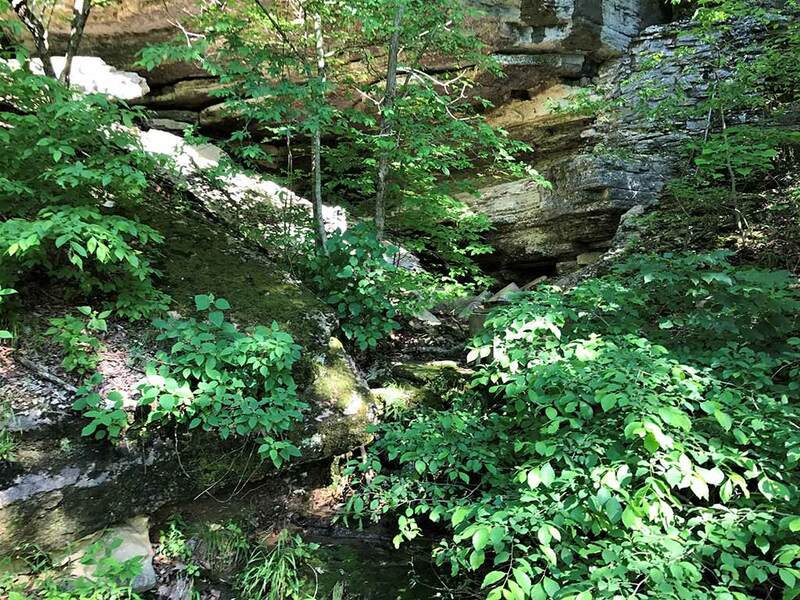 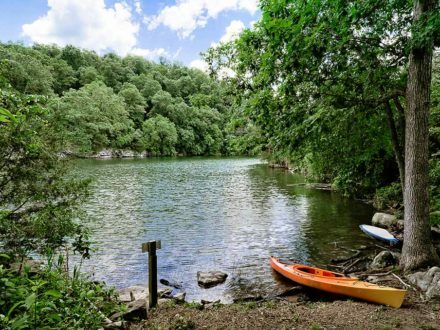 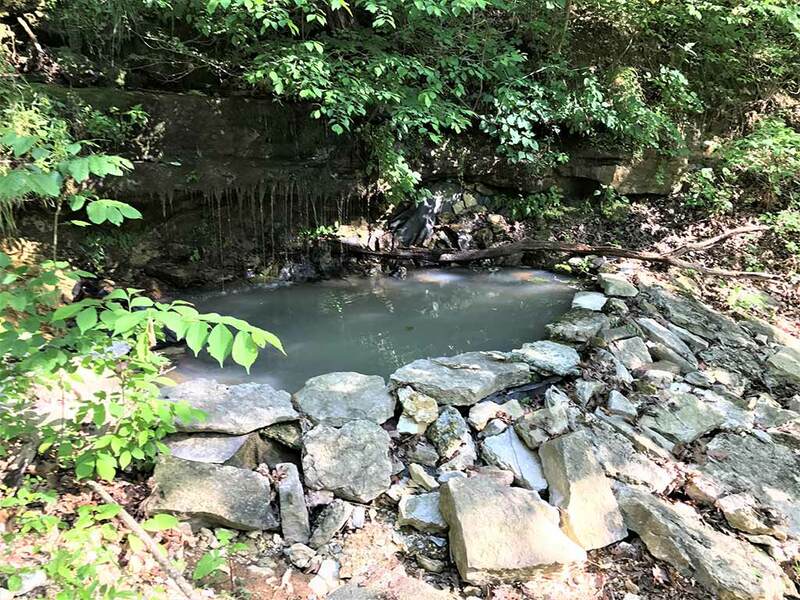 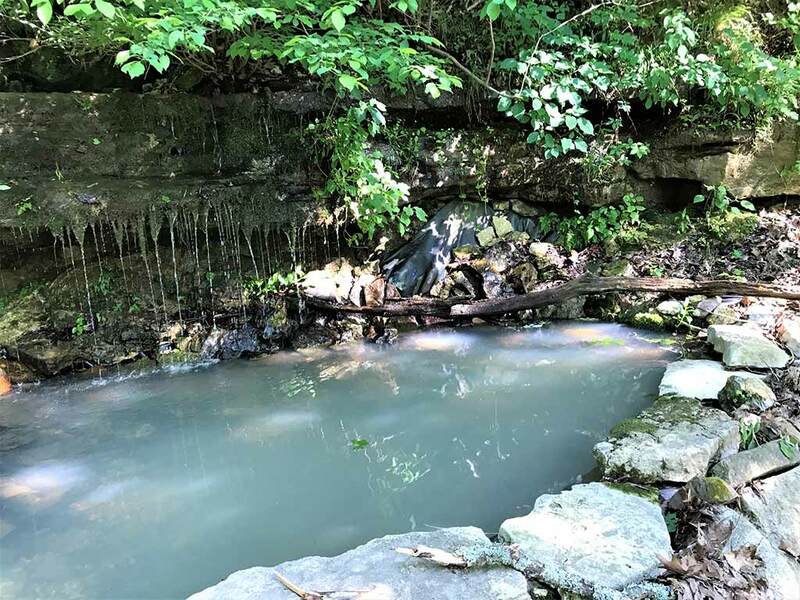 Wander down the trail to a natural spring that has been built up to make a nice water feature and great place to sit and relax. 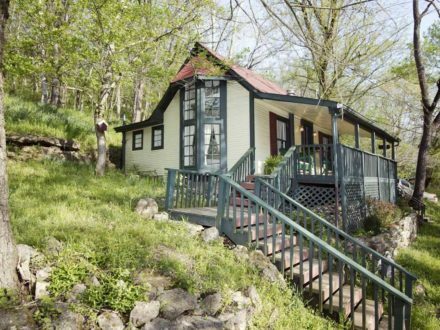 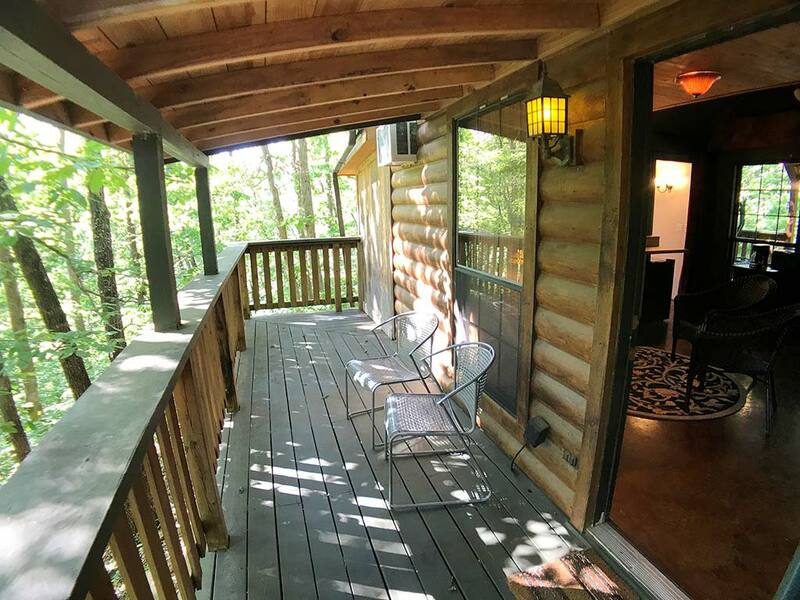 This cabin is only a 3 minute drive from downtown. 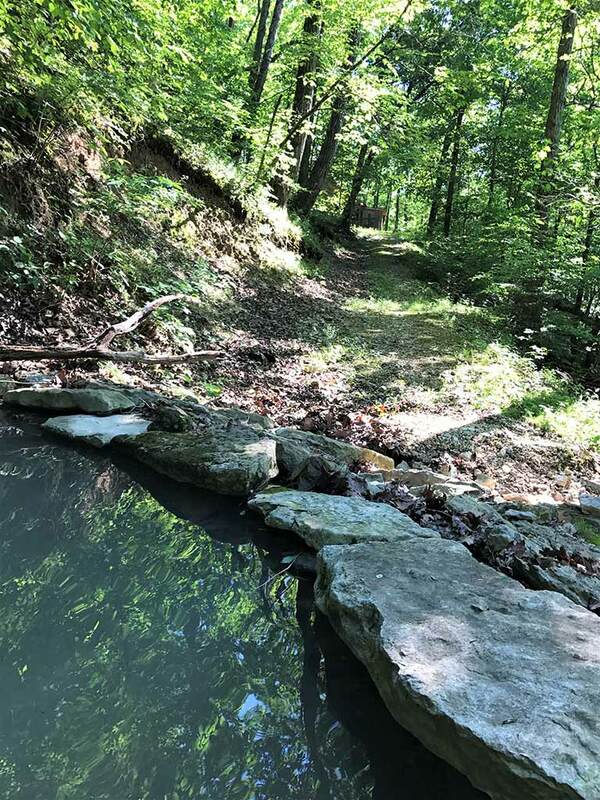 Please note – Hyde Hollow Road is a secluded residential area. 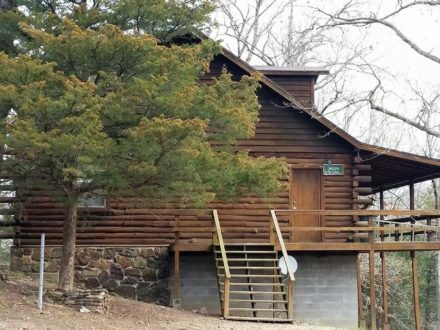 This Cabin is the first right hand turn on Hyde Hollow. 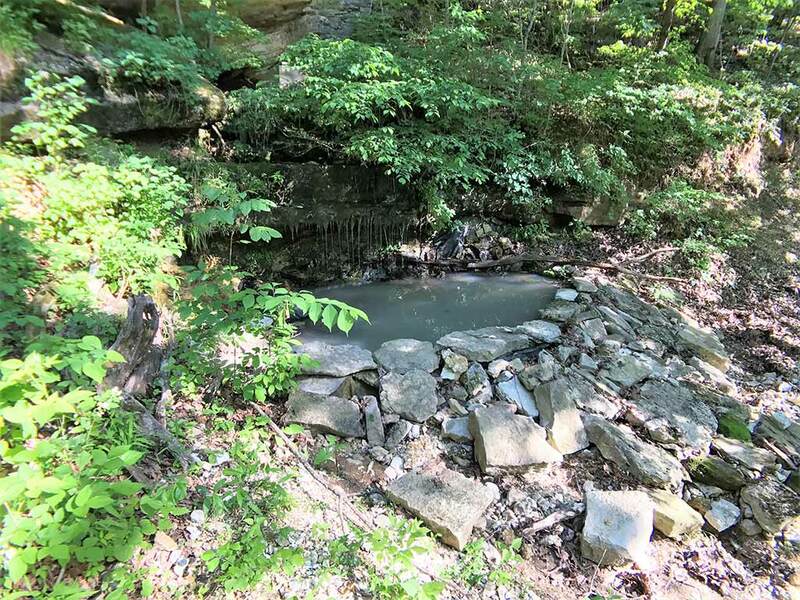 Please do not venture down Hyde Hollow Road, there is limited space for you to turn around at the end of the road.